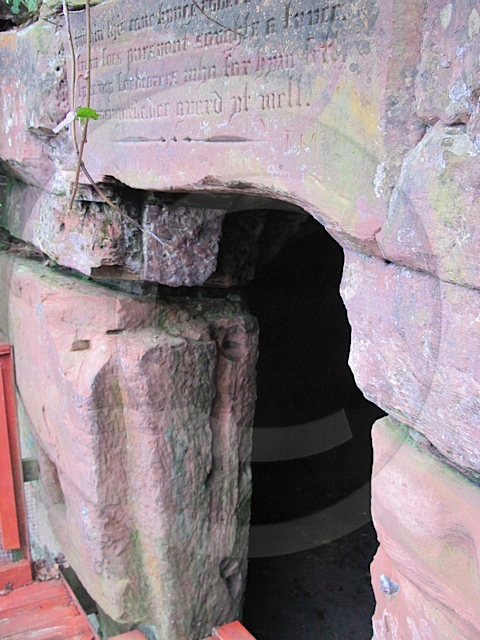 A small cave formed in a red sandstone of a cliff on the Cove Estate in Kirkpatrick Flemming, is said to be the place where Robert the Bruce went into hiding on 1306. Following defeat in the winter of 1306, King Robert the Bruce of Scotland went into hiding in a cave, to avoid capture by Edward I (Longshanks) of England. It is said that Bruce spent three months living a solitary existence in this tiny cave and during this time, it is here that legend tells of Bruce, watching a spider toiling to build it’s web. The spider would make many attempts to spin his fine threads and even when it fell, it climbed up again and carried on relentlessly until the web was spun. Robert the Bruce, at an incredibly low point in his life, took inspiration from this little spider, encouraging him to try again. He raised an army and went on to win the famous battle of Bannockburn in 1314, after which, he finally established his claim to the Scottish throne and thus the beginning of freedom from English rule. The event is thought to have given rise to the saying ;”If at first you don’t succeed try, try and try again. Small brown signs indicate the route through Kirkpatrick Flemming, just outside Gretna Green, to Bruce’s Cave. The route proceeds into a caravan park where hand painted signs indicate a road to the left, past some old farm implements and to a parking area in front of the estate house. At a building to the left of the house, tickets can be obtained ( £1 each), to view the cave. The walk proceeds down a very pleasant path surrounded by woodland, towards Kirtle River. Continuing down a concrete stepped hill for a few hundred meters, the path turns through a gate and onto a wooden walk way which leads to the cave entrance. 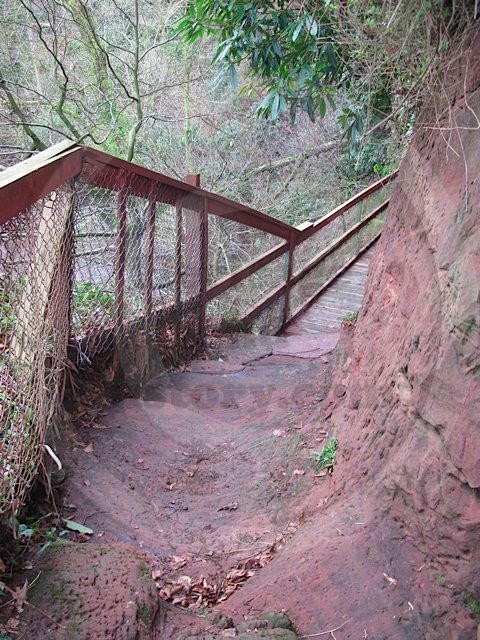 Carved out of the red sandstone cliff, about 30 feet above the river, Kirtle Water, the cave is about 12 feet in diameter and only about 7 feet at it’s highest point. 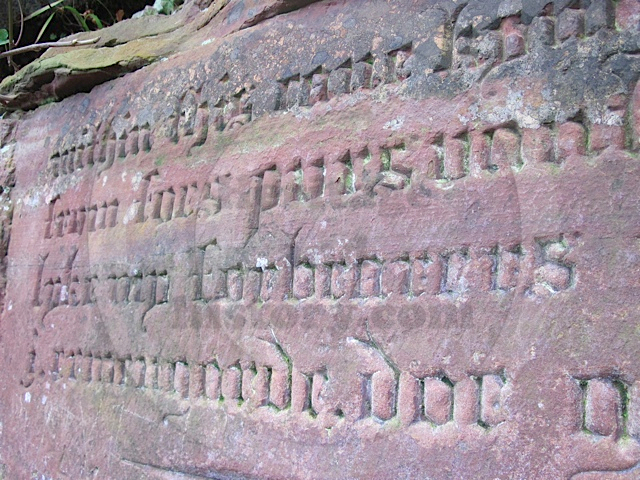 Numerous carvings and graffitti mark visits over the years, some dated around the late 1800’s. 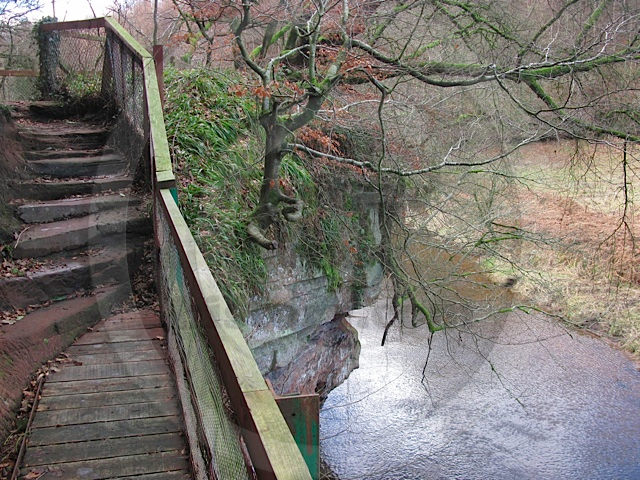 Although access today is by a pathway provided by the local council in 1929, previous visitors had to be lowered on a rope over the overhang, from which they would swing into the cave. Needless to say, this resulted in many accidents. 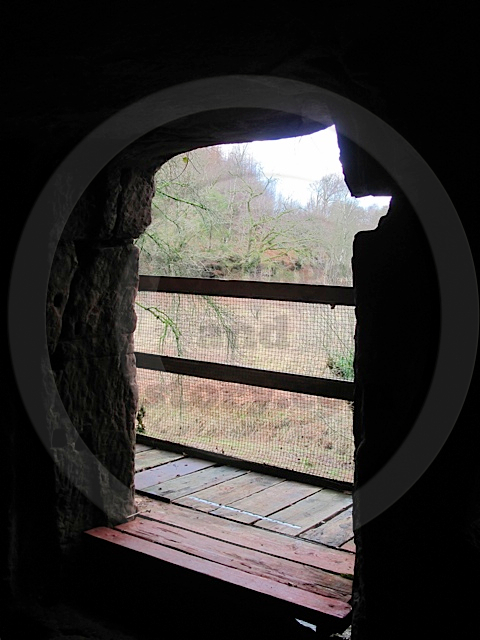 Various sites lay claim to having the cave in which Robert the Bruce hid from his foes. Robert the Bruces’ land at Gretna was the first settlement on the Scottish side of the Solway and formed part of Bruce’s lands in Annandale. This cave is thought to be the likely place, as some versions of the legends talk of a local, Sir William Irving, who was hiding Robert the Bruce for three months in his secret cave. However, the actual cave remains a mystery a mystery. The cave at Cove Estate in Kirkpatrick Flemming is probably the strongest contender after the Irish cave on Rathlin Island, which is the one favoured by the Bruce family to this day, due to the fact that in the 14th century, the area on Rathlin Island was owned by Bruce’s Irish mother. There is also a castle on Rathlin called Bruce’s castle which gives further credibility to the claim. Other Scottish caves laying claim to the legend are; Drumadoon at Blackwaterfoot on the Isle of Arran and Craigruie near Stirling. 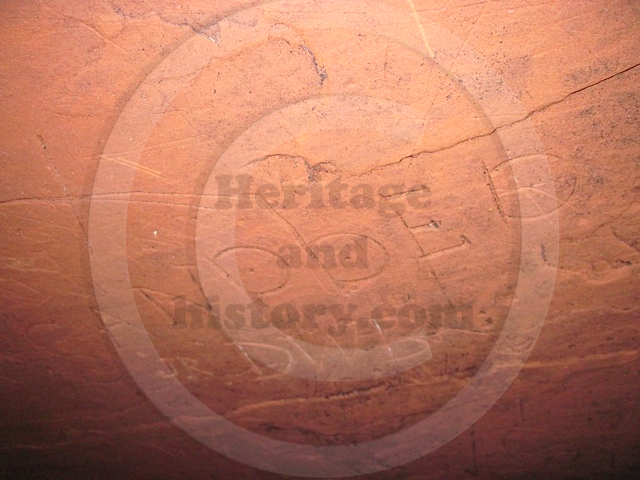 Bruce’s Cave – Official website of the Kirkpatrick Flemming cave. The Bruce Trust – The Robert the Bruce Commemoration Trust’s long term aim is an innovative, living history visitor centre in Dumfriesshire dedicated to Scotland’s hero king. Bruce Rathlin 700 – More information about how Rathlin Island features in Robert the Bruce’s story.